BUIES CREEK, N.C. (Sept. 5, 2018) - Despite taking an early lead, the Dash fell to the Buies Creek Astros 5-4 in Game 1 of the Southern Division Championship Series at Jim Perry Stadium on Wednesday night. Winston-Salem (0-1) scored the first runs of the game in the third inning against Abdiel Saldana. After Luis Robert walked on four pitches to start the inning, he moved to second on an infield single from Luis Gonzalez. Following a groundout from Nick Madrigal, Blake Rutherford delivered a two-run single through the left side to give the Dash a 2-0 lead. Luis Martinez entered the game in relief of Nate Jones, who threw a scoreless inning in a rehab appearance with Winston-Salem. Jones retired the side in order, tossing eight pitches and notching a strikeout. Martinez proceeded to strike out five and allow only two baserunners across his first three frames against Buies Creek (1-0). But, on the first pitch of the fifth inning, Martinez surrendered a leadoff homer to Chuckie Robinson that cut Winston-Salem's lead in half. The Astros took the lead later in the inning. After Martinez walked three batters to load the bases, Corey Julks delivered a two-out single to center to give Buies Creek a 3-2 lead. But, the Dash tied the game in the seventh. Zach Remillard led off against Tommy DeJuneas (1-0) with a double down the right-field line, and he moved to third on a sacrifice bunt from Laz Rivera. Robert followed with a sacrifice fly to center to bring home Remillard and tie the game at three. However, Buies Creek struck back in the bottom of the seventh against Danny Dopico (0-1). After walking Cody Bohanek to start the inning, Dopico struck out the next two batters he faced. But, with two outs, Dopico walked the next three batters, the last of which was Bryan De La Cruz, to force in the go-ahead run. The Astros tacked on an insurance run in the eighth when Robinson reached second base on a throwing error by Rivera and subsequently scored on a double down the left-field line from Jake Adams. 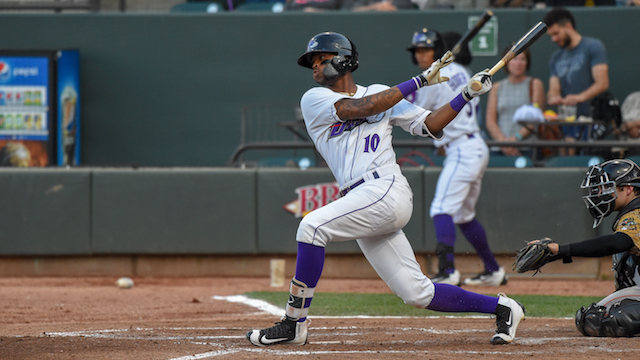 Ti'Quan Forbes crushed a solo home run in the ninth to bring the Dash closer, but Enoli Paredes earned his first save at the High-A level by striking out Remillard and Rivera to end the contest. Winston-Salem's playoff run, presented by Pepsi and NCDOT, continues on Thursday at 6 p.m. against the Buies Creek Astros in the Southern Division Championship Series with Lincoln Henzman (0-1, 2.60 ERA) on the mound for Game 2. Pregame coverage begins at 5:45 p.m. and fans can listen on WSJS Sports (600 AM and 101.5 FM) and wsjssports.com. After the first two games of the series in Buies Creek, Winston-Salem returns to BB&T Ballpark for Game 3 on Friday with first pitch at 7 p.m.